Lack of support and constant infighting among CIA-trained terrorists are plaguing the coalition tasked to depose Syrian President Assad. No less than the terrorist commanders are threatening their sponsors that they would surrender in 2 days if no outside support is forthcoming. Rebel groups accuse each other of committing treason and starting ceasefire talks with the Damascus government, reports said. Terrorist groups are still preventing civilians from leaving militant-held districts of Aleppo despite their public claims to the opposite. Several militants fled the Eastern neighborhoods of Aleppo city and surrendered to the Syrian army this morning. Two of the surrendered militants were transferred to the city hospitals to be treated there. On Saturday, Abdullah Muhammad al-Muhaysini, the religious leader of the Jeish al-Fatah coalition of terrorist groups, acknowledged militants’ defeats and expressed surprise at the rapid advances made by the Syrian government forces in the Eastern districts of Aleppo city. The Saudi Mufti (religious leader) termed as fruitless the start of any fresh offensive by the militants, given the absence of unity and widening gaps among the militants, and regretted that unity is no more of any use after the almost complete fall of Aleppo to the army and the recent evacuation of all militants from Damascus. The Syrian army units started special operations in Aleppo after several humanitarian pauses declared by Damascus and Moscow to give a chance to the civilian population as well as the militants to leave the Eastern parts of the city through 8 corridors. … Meanwhile, terrorist commanders stationed in the Eastern parts of Aleppo have threatened al-Muhaysini that they will be forced to give up the fight and surrender the city to the army in the next two days if not rescued from outside as a number of terrorists have called for the Syrian government’s green buses to take them to other regions. The Syrian army’s rapid advances in the Eastern districts of Aleppo have perplexed the terrorist groups and created chaos among them. 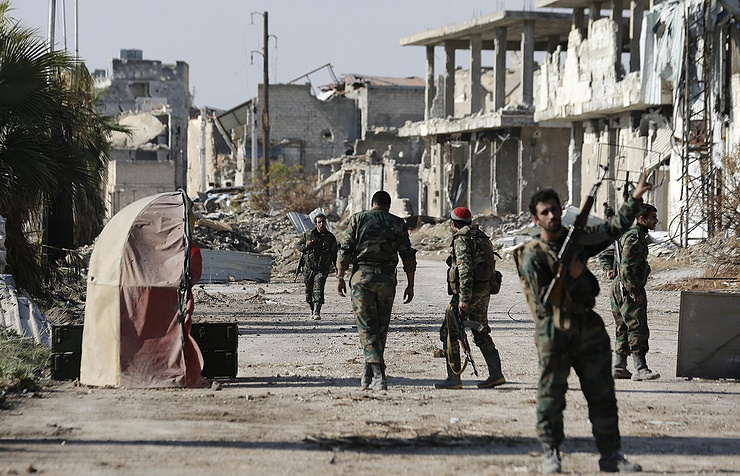 The Syrian government’s tapping of contacts and radio exchanges between the terrorists in and outside Aleppo showed that the militants who are stationed outside the city are asking their comrades to reconstruct their lines immediately to prevent any further collapse. An informed source in Eastern Aleppo also said last Saturday that Fatah al-Sham Front was in dire conditions and trying to persuade civilians to join them to slow down the Syrian army’s devastating advances in the region. Local sources in Eastern Aleppo have also reported that the terrorists have lost confidence in their commanders after their repeated unfulfilled promises on breaking the army’s siege and their morale has weakened after heavy defeats and sustaining abundant casualties and damages. After continued defeats and nearly two months of insistence on remaining in the city and rejecting the army’s several chances to leave Eastern Aleppo with their weapons, terrorists are now facing the realities of war as their comrades’ massive attacks on the city to break the army’s several-month-long siege have all ended up in a fiasco. As a sign of desperation, the terrorists decided to hit a civilian hospital again, injuring RT journalist on site. A journalist from RT Arabic, Somar Abudiyab, was injured in the shelling of a Russian military mobile hospital in Syria’s Aleppo. “Abudiyab as a member of the Russian pool was filming the consequences of the hospital shelling when fire resumed. He was slightly injured in the leg, no other journalists were injured,” the statement on the RT website said. During the similar shelling a Russian doctor was killed and two other wounded. MOSCOW, December 5. /TASS/. A Russian female army medic was killed in a hospital shelling by militants of the opposition forces in the Syrian city of Aleppo while two other medics were wounded, Russia’s Defense Ministry spokesman Major-General Igor Konashenkov said on Monday. “Today, from 12:21 to 12:30 Moscow time, the medical center of the Defense Ministry’s mobile hospital was subjected to the militants’ artillery fire while receiving local residents. As a mine directly hit the hospital’s reception department, one Russian female medic was killed. Two other medics were heavily wounded. Local residents who had come to visit the doctors were also hurt,” the spokesman said. Update: Two more paramedics were also killed, a day after another bombing was directed in the same hospital. Attacks on civilians in the recent past are all blamed on the Russian-led coalition as a bargaining chip for the imposition of terrorist-friendly ceasefires. But Russia is already giving its US counterparts the ultimatum that all remaining armed personnel in the area of conflict will be classified as terrorists, they really are. “Those groups which refuse to leave eastern Aleppo will be treated as terrorists. By refusing to walk out from eastern Aleppo they will in fact go ahead with armed struggle. We will treat them accordingly, as terrorists and extremists, and support the Syrian army in its operation against such armed gangs. The US State Department and the White House are in turmoil at this transition time. We are hoping that they could not organize another “mistaken” airdrops of war materiel for the “moderate rebels” on the ground in Aleppo, and the sufferings of the residents there are finally ending in a few days. The area recovered in Aleppo has now increased to 65%.